You can’t fault Freddie’s Revenge for being ambitious. 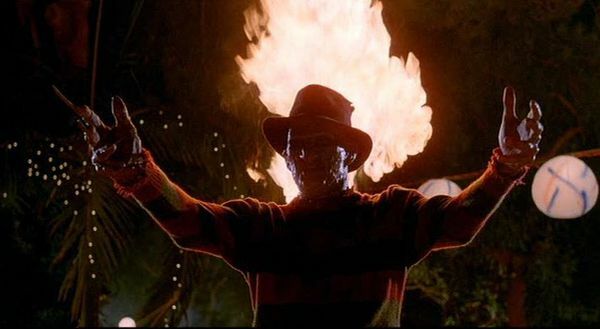 Not content to just repeat the same old formula and rehash what the original Nightmare on Elm Street tried to achieve, Freddie’s Revenge actually attempts to add something different to the series and take the demon serial killer in a slightly different direction: and it works – for the most part. For starters, you know something is unusual because the hero is a boy. Not typical for a slasher series, but refreshing enough. That doesn’t mean there isn’t a heroic girl as well, just that she isn’t the focal point of the whole movie. To buck slasher trends, the hero is a boy. It has to be a boy because Freddie’s revenge is to enter the “real world” by possessing our hero, Jesse played by Mark Patton. This is the first issue with Freddie’s Revenge as Patton isn’t up to the task of leading man and doesn’t really possess the required charisma or appeal needed for the role. You don’t care that his life is in danger and when you put him up against someone who is all charisma, like Freddie Kruger, this becomes an issue. This does mean that Robert Englund is back as the titular villain and just as effective as he was in the original. He has slightly more to do here and his motives are clearer. He has actual dialogue which adds some bite and threat to the grotesque character. Unfortunately, some of the more creative elements are lacking. Like in the first, the only thing that can hold Nightmare on Elm Street and the character of Freddie Kruger back is a writer’s imagination. This means we can have Freddie Kruger in any manner of situations and like in the first film, with any manner of exciting kills. This is where Freddie’s Revenge lacks bite, not quite being as creative as it could have been. The boiler room is back, the basement makes a return and it may make people think twice about taking a bus but compared to the bath or bed kills from the first movie, this is lacking in inventiveness. That is until Freddie begins his possession. This is done quite well and adds some genuine horror to the movie. Be it the death of a key supporting character that makes towels terrifying or the actual process of the possession which moves towards body-horror, before films like Saw rewrote what this actually meant. This possession is supposed to lead us to the biggest selling point of the movie but it is one that never really pays off. The idea is that Freddie is trying to break-out into the “real-world” to continue his killing. Nothing will be spoiled here but this never really comes to fruition properly and what we ultimately get is a climax that doesn’t stray too far from what was done in the original. Overall, Freddy’s Revenge is a sequel that tries to move away from the original but never succeeds as you’d hope. There are some interesting ideas, particularly with the central theme of “possession” and “breaking-free” but nothing has the pay-off you’d hope for. Robert Englund is still the MVP of the series though.